A reader wrote to ask where William S. Burroughs is buried. The short answer: Bellefontaine Cemetery, which is located at 4947 W Florissant Avenue in Saint Louis, Missouri. Burroughs’ grave does not yet seem to have become a popular hangout, like Jim Morrison’s grave in Paris. Maybe this is because it’s in the midwest. Maybe it’s because Burroughs’ death is still relatively recent and it’s unclear to RealityStudio whether there is even a specific marker for Burroughs the writer. The family plot is marked by an obelisk in honor of Burroughs’ grandfather, inventor of the adding machine. There were plans to build some marble benches and plaques listing names of those in the family plot. Does anybody know if these plans have come to fruition yet? Here is a picture of the obelisk and a brief description of the cemetery by someone who went to pay his respects. John Giorno also published a list of the various items that were included in Burroughs’ coffin. (Skim down the page to “The Death of William Burroughs.) Giorno writes: “I was with William Burroughs when he died, and it was one of the best times I ever had with him.” I wonder if Burroughs felt the same!?! 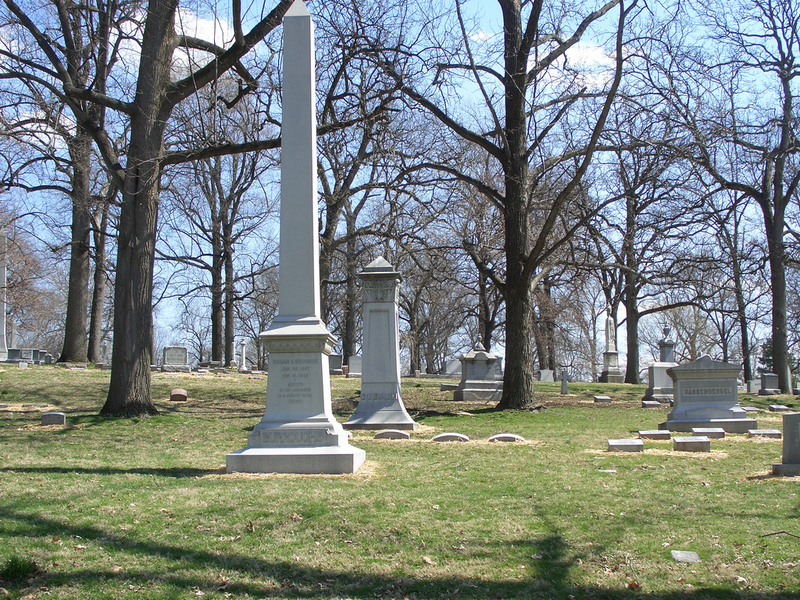 Jay Dugger (blog, suprglu) visited the Burroughs family plots at the Bellefontaine Cemetery in St. Louis. He took several pictures and commented that “the cemetery staff are quite friendly and very helpful, and even eagerly share stories about Mr. Burroughs.” There is still no marker for William S. Burroughs the writer, who was buried just to the right (in this picture) of his grandfather’s obelisk. (Jay’s photos at flickr outline the spot.) Jay also took a close-up of the inscription on the marker for William Burroughs the inventor. Please note that Jay’s photographs have a Creative Commons Attribution ShareAlike license. Many thanks to Jay! The town of Lawrence, KS, named a creek after Burroughs in May 2004. The former Atchison Topeka and Santa Fe Tributary is now officially called Burroughs Creek, in honor of the many years the famous author spent in Lawrence. A month later, on July 15th, 2004, the Commission approved a motion that Burroughs’ former residence be added to the Lawrence Register of Historic Places… Might it become a William S. Burroughs museum? As of last weekend, the grave has a marker. You can see it at the link below. first time I read this and will question that J Giorno was “with WSB when he died” utter bullslhit. what he is talking about is some Tibetian deal where the soul leaves the body x number of days after breathing stops. lots of folks were at his funeral and burial in St Louis. Giorno is a good guy but not this. WSB died in Lawrence Memorial Hospital and James Grauerholz and Tom Pechio were there. Period.